The first 180 days of employment are crucial to the success of new hires, say experts. Checking in regularly with a mentor allows new employees to acclimate to the company and the job more quickly, and increases the likelihood of retention, high performance, and growth. As Kraus-Anderson continues to experience record growth, a new KA Mentor program is bringing together new and seasoned employees to help maximize success during those critical first months of employment. The KAmbassador program launched earlier this year, and it’s proving to be a rewarding effort for all involved. Q. What is the KAmbassador Program? TIM MAYER, : KA’s new approach to mentoring. We deconstructed and rebuilt our Project Manager Mentor program to make it less structured, and inclusive of all our employees and office locations. In addition, the new format is flexible and provides central responsibility to the KAmbassador as a single point of contact. Our KAmbassadors commit to a 12-month time period to cover the onboarding cycle of mentees assigned during that period. Typical mentor/mentee activities may include a kickoff meeting to discuss expectations; scheduled and impromptu meetings or lunches; job site tours; attending a KA Has Heart activity or other teambuilding activity; and other group events. Q. What is a KAmbassador? KAmbassadors are good listeners. Jennifer Parent with Emily Winters. TIM MAYER, DIRECTOR, TALENT ACQUISITION: A KAmbassador is a KA employee who is knowledgeable about working at KA, our values, and the culture here. They are good listeners, advisors, and confidantes. They possess good empathy skills that help them remember what it’s like being in a new and unfamiliar environment; and they bring patience and respect to their interactions with mentees. Q. The program launched this spring. What are the mentees telling us about their goals going into the program, and their feedback so far? PAYTON HOSCH, PROJECT ENGINEER, TWIN CITIES: Some of my goals were to get placed on a good project, get involved in company events, and work on project managing skills. My KAmbassador helps in these areas by giving suggestions and being there to ask any questions I have-especially ones I’m unable to ask my boss about. TAMARA KURAK, PROJECT COORDINATOR, TWIN CITIES: We’ve chatted about classes to take, and she’s helped me learn the building. Having Silvia as my KAmbassador is a highlight! LAURA GEROLD, PROJECT COORDINATOR, TWIN CITIES: I have a “go to” person for all of my questions! JOHN NORDBY, ASSISTANT PROJECT MANAGER, TWIN CITIES: I was hoping there would be a culture of openness for questions and so far that has been the case! My KAmbassador is easily reachable and conveyed that I can ask just about anything, it’s a good feeling to have, being comfortable to ask questions just makes for a better work environment. 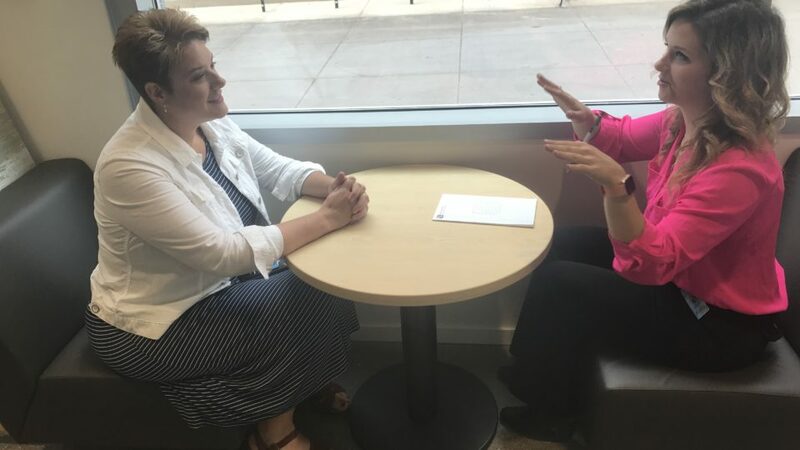 EMILY WINTERS, HR ASSISTANT, TWIN CITIES: Beginning my career fresh out of college I wanted to start by making connections with different people and my KAmbassador has guided me with tools and tips on how to do that. She encouraged me to join the Emerging Professionals group here at KA, which deals a great amount with making connections inside and outside of KA. Growing in my career is something I am passionate about. This program makes you take some time out of your work day about two times a month to focus on how to better yourself and achieve your goals. Q. What feedback have the KAmbassadors provided about their mentor experience so far? JENNIFER PARENT, MANAGER, MARKETING PROPOSALS, TWIN CITIES- By far this has been most rewarding for me. Just learning about Emily Winters and just how awesome she is not only as a person, but as a KA employee, has been rewarding for me. It has been fun reflecting back on being new and reliving that through the eyes of our new people (even though that was so long ago already!) It’s fun to hear from Emily what she loves about KA and what makes this a great company to work for. She has that twinkle in her eye. JASON RENTMEESTER, SENIOR PROJECT MANAGER, TWIN CITIES: Helping the mentee understand how to get the most out of their experience at KA has been a highlight. JAMIE NAGEL, KA REALTY PROPERTY MANAGER, TWIN CITIES: I am developing my unbiased listening skills. CHELSEA OLDHAM, OFFICE MANAGER/MARKETING COORDINATOR, BEMIDJI: Mentoring a new hire, has the benefit of providing a new perspective on our work and the tools/technologies that might be helpful. MIKE DOSAN, SENIOR PROJECT MANAGER, DULUTH: It is really nice to provide the support to help a new hire get started in their career at KA. It is very gratifying to help retain good people.